On December 10th, 1962, fifty years ago today, David Lean’s LAWRENCE OF ARABIA had its Royal World Premiere in London at the Odeon Leicester Square. Five days later the epic film premiered in the United States. Presented here to commemorate the golden anniversary of the classic film’s release is a list of (most of) the North American reserved-seat “roadshow” engagements in which the film played. These were the theaters that exclusively played the film before it was given a nationwide general release, and, unlike most of the film’s general-release engagements, these roadshow presentations featured stereophonic sound (the majority in 70mm with 6-track stereo, and some in 35mm with 4-track stereo), advanced admission pricing, an average of ten showings per week, an overture, intermission, entr'acte, exit music, and souvenir program booklets. This (work-in-progress) list has been created for the sake of historical record, but also is a celebration of the fondly-remembered cinemas in which LAWRENCE OF ARABIA played as much as it is a celebration of the film. The bookings are arranged chronologically by premiere date, and duration data, measured in weeks, has been included for selected entries. You are invited to share your memories of seeing LAWRENCE OF ARABIA and/or thoughts on this article. In particular, please comment if you saw LAWRENCE in one of the “cinema treasures” featured in this retrospective or if you have any useful information to add to the list. References: various issues of regional newspapers, Boxoffice and Variety. Special Thanks: Jim Barg, Raymond Caple, Sheldon Hall, Bill Kretzel, Mark Lensenmayer, Stan Malone, Vince Young. The closest that I’ve come is seeing in 1989 the “restored” version in 70mm, 6 track Dolby SR on the huge screen at the Uptown Theatre in DC. I didn’t see the color corrected version of a decade ago, or the version shown recently in US multiplexes in 4k. But, the version that I saw was one of the best movie experiences of my life! “Lawrence” is a bit of a sad memory for me for it was the last film shown at Thomas Lamb-designed Loew’s Stillman in Cleveland; after its reserved seat run there closed, the auditorium was razed and all that remains is a bit of the lobby used as an entrance to a parking structure built for he adjacent Statler-Hilton Hote . The closing of the Stillman basically began the slow and painful decline of Cleveland’s Playhouse Square. One after another, the great theaters of the area – the Stillman, the Allen, the State, the Ohio, the Palace, the Hanna – would all close. Fortunately, they – except for the Stillman – would survive to be restored, though they were some close calls before that happened. The 1971 re-release of LAWRENCE OF ARABIA was cut back from it’s 216 minutes running time. The restored 1989 version of LAWRENCE OF ARABIA brought back it’s full 227 minutes running time that was complete with full Overture, Intermission and Exit Music and was presented in selected theatres in 70mm, 6 Track Dobly SR. The 1971 re-release ran 189 minutes in which a full half of the movie was edited. LOA played at the Shoppingtown in Syracuse NY not at the Eckel. LOA was the opening attraction at the Eric in Harrisburg PA at 4400 Derry Street on April 26, 1963. The Carolina Theatre in Charlotte was the film’s only reserved seat engagement showing in the Carolinas that opened on September 25,1963. I don;t have the information as to where LAWRENCE OF ARABIA played at in South Carolina,but I do have the original ads from several North Carolina papers as well as it’s reserved seat engagement showing at Charlotte’s Carolina Theatre. Mike, LOA opened in Syracuse on 5/9/63 and played till 8/6/63. The Eckel engagement was a moveover. I should have said Shoppingtown 5/9/63-8/6/63 and Eckel from 8/7/63. It is interesting to see the rather short engagements on LOA when you compare them to other reserved seat engagements around the same time. Some weeks ago, I went to that recent one-night-only showing of the restored and digitally presented LOA at the Regal Saint Louis Mills megaplex here in the Saint Louis area. (There were all of three people in the large screening room including myself). The overture began, just as it did when first released, but unlike the original roadshow presentations, the lights were not dimmed. Another reminder that I am getting old. i first saw LOA on the 1971 VHS print, it was good. Then i saw the widescreen 1989 vhs edition, and loved it. The DVD version from 2002 is terrible quality. I heard the 2012 version is better. I saw Lawrence in March 1964 at the Rivoli in Rutherford NJ. I remember thinking at the time that I must’ve been very smart for a 9-year-old because not only did I sit through a 3 ½ hour movie, but I actually liked it and understood it. Although I’m sure I didn’t really understand some of it, like the Jose Ferrer gay sequence. I also walked in during the 2nd half of the movie, a common practice at the time, and stayed to see what I missed. I walked in while Lawrence was walking through puddles of water in the street, looking for “some way to announce” himself. When the restored Lawrence played the Ziegfeld in NYC in 1989, sold out shows were a common occurrence. At the ones I attended, there was always a much longer-than-normal line for the water fountains at intermission! i recently watched the new blu-ray hd disc and its a revelation both visually and audio wise. in two of the extras-a nice narrated short about the various ad campagins from its releases and in the making of doc. it is noted that almost immediately after its roadshow engagements in the U.S. started up they was a move to tweak the film. the reason given was supposed complaints from theater owners about its length and the number of showings they could schedule. now i know it was common practice to tweak a film after it finished its first run roadshow engagements and was sent to neighborhood theaters around big cities. so why were theater owners so antsy about the film’s length in its original roadshow engagements when they only ran two shows a day anyway. i can think of a number of films released on roadshow runs right before and right after LOA that were almost as long but were not tweaked till they went to neighborhood theaters. so why was LOA tweaked almost immediately after it debuted? I remember reading somewhere that David Lean himself wanted to shorten the film right after it opened. I also think he wanted to take out the intermission. I guess some filmmakers don’t have the same fondness for intermissions as most of us roadshow fans do. Robert Wise also preferred that West Side Story not be shown with an intermission, although roadshow theaters which showed the film were given the option to use it, or not. If the information on its Wikipedia entry is correct, in the section labeled Theatrical run, Lean himself ordered and supervised the cuts during the roadshow runs in response to criticism that the film was running too long. There is also a story that Lean later blamed this initial set of cuts on demands from Producer Sam Speigel, which may or may not have been true. The film’s entry at the IMDb (under Alternate Versions) describes the cuts in detail. Directors sometimes do this; Kubrick took almost twenty minutes out of “2001” after its premiere. It is usually done to tighten the pacing. I saw LOA in the fall of 1963 when I was 12 and still too young to enjoy this movie. As was our custom, the entire family went to what was a sparsely attended Saturday afternoon showing. We usually went to the movies on Friday nights, so I assume that this was due to the long running time. Seeing this on a Saturday afternoon when I would have been playing neighborhood football while my parents worked around the house and yard is probably the reason I even remember LOA at all from that first viewing. I would have much rather stayed at home or gone to whatever Walt Disney movie was available. Within a couple of years I would be old enough to appreciate this type of movie as I did with Sound Of Music, and most especially my favorite of all of the Lean films, Doctor Zhivago. In 1971 I saw the reissue at the Loew’s 12 Oaks Theatre in Atlanta, my first visit to this theatre that I would find myself managing one day. I enjoyed the movie, but did not think that it was in the same class as Zhivago, which is what I was hoping for. The presentation was only fair with the huge 1200 seat auditorium sounding pretty hollow since the theatre only had mono sound. I finally saw LOA in 70MM at the Fox Theatre during the 1978 Fall Film Festival, and the great picture and sound made it much more entertaining. In 1996 I started working in the Fox booth and have had the pleasure of running LOA twice, once in 70MM, which led to one of the more disgraceful episodes of my booth days. Like all projectionists, I have had my share of snafu’s, but for the most part I was able to recover to the point that the audience rarely noticed. And, as I was once told, if no one sees your mistake it didn’t happen. In this case, 2000 people noticed when I managed to trip over the return film path. Under the glass of my desk I keep a four frame strip of Omar sitting at the oasis, with one of the frames burned out. I find it a good reality check. In 1971,I saw the re-release of LAWRENCE OF ARABIA at Durham’s Center Theatre,and from what I saw was a movie that was edited from it’s original running time. But I never understood it then,and I did when I went back to see it again in 70MM at the Uptown Theatre in Washington,DC in 1989 to great applause in which the great picture and sound made it much more entertaining and also it was restored to it’s original running time of 227 minutes. The 1971 re-release was “butchered”. “Lawrence of Arabia” is another great old classic and one of my favorite films. I’ve seen LOA a number of times, enjoyed it a great deal, and I attended the one-night 50th-year Anniversary screening re-release of “Lawrence of Arabia” here in Boston, at the Loews AMC Theatre, in Boston Common. This was a digitally-restored print of LOA. The soundtrack was crisp, the film absolutely pristine, and it was all like new! I was a very fun, albeit a long evening, and getting home well past midnight was well worth it. I also might add that “Lawrence of Arabia” has some excellent actors in it, such as Peter O'Toole, Alec Guiness, Anthony Quinn, to mention afew. The reason that “Lawrence of Arabia” only played for 3 weeks at the Nixon Theater in Pittsburgh, PA is that the theater caught on fire and was heavily damaged. 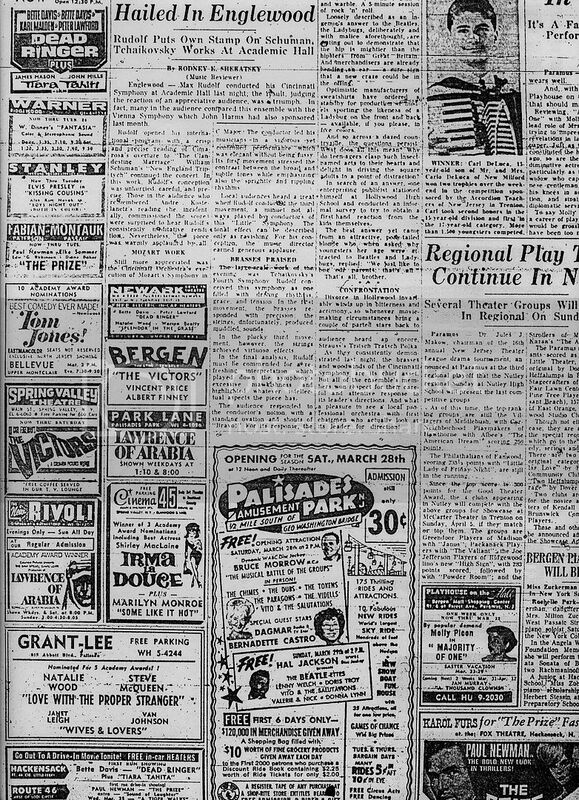 “L o A” opened on April 3, 1963 and the film was transferred to the Fulton Theater for the rest of its premiere run, but it didn’t do as well there and only lasted until “Bye Bye Birdie” replaced it on June 19, 1963. I first saw “LAWRENCE” at the Metropole Theater in Victoria, London on April 20th 1963. This was the 202 minute version which had been cut back from the premiere 222 minute version which ran at the Odeon, Leicester Square. The 202 minute version ran in 70mm on a re-issue in 1971 at the Dominion, Tottenham Court Road but was further trimmed by about 30 minutes when shown in the US.I saw “LAWRENCE” several times at the Metropole and it still remains my favorite film.